Description: A unique car, the dream of all lovers of luxury sports cars. 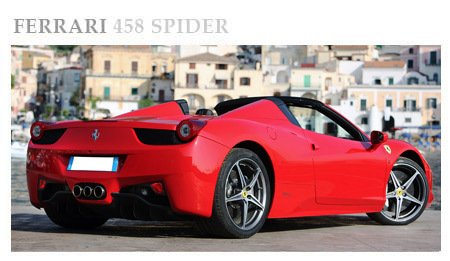 The performance of the Ferrari 458 Italia are both exciting in cornering and on the straights. The look scratchy and the perfect of the internal dimensions, ensure maximum comfort. A perfect car. One of the most beautiful sports cars in the world. 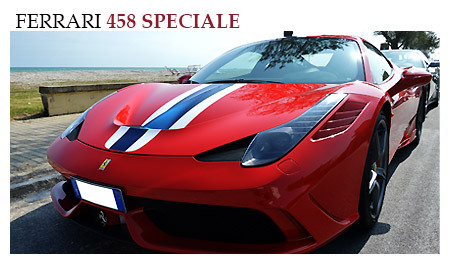 The engineering innovation and refined design, offer pure driving pleasure and pride of those who has the good fortune to drive a Ferrari car. The interior is rich in details that give extra feeling of sportiness. The seats envelop the driver for maximum comfort for a long trip. Description: The Queen in terms of comfort and interior space. It is distinguished by the richness of the preparations and the behavior on the road that offers high reliability and safety. 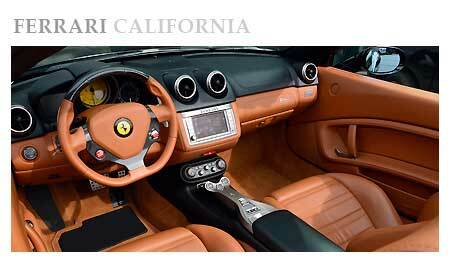 The functionality and versatility of the interior, combined with an elegant and prestigious line, make the Ferrari California one of the most popular cars with our customers. Description: Sophisticated design and impressive technology to give a unique driving pleasure. Even on long trips is able to give good feelings with the canopy opened and the wheels well planted even on the most demanding roads. The internal dimensions are perfect for accessibility and comfort. 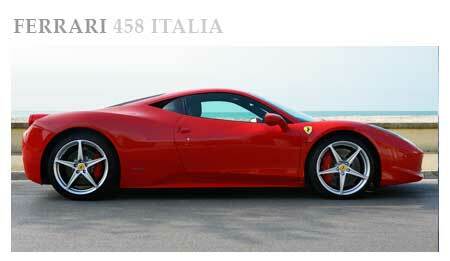 The power of the engine as exciting as all models of Ferrari Push in the accelerator: third, fourth, fifth. In a moment you are at the highest levels. Description: It allows an easy and intuitive drive with a sprint from 0 to 100 by chills. It's a great car that leaves you breathless, with a fierce and eye-catching design, where every inch exudes perfection. Awaits one of the most exciting driving experiences ever tried. The high-quality materials of the interior, will enchant you with exclusive details that smell luxury. Everything is designed to impress even the most demanding rider thanks to the technical skills of the highest level that allow you to drive it even in extreme environments such as snow or ice. Luxury Hotel & Villa in Rome Italy. Delivery of the car in less than 5 minutes of arrival. Top Luxury Service offers a 5 star service with exclusive delivery by an assistant staff. No waiting, no lines to do. In less than 5 minutes of arrival the guest will be accompanied to the car and handed the keys. The time required for a signature in the documents and start the engine and go. Top 10 rome things to do: Via Condotti, Via Veneto, Spanish Steps, Vatican City, The Westin Excelsior Rome, St Regis Grand Rome, Jumeirah Grand Hotel,The Westin Excelsior, Stadio Olimpico, Colosseum, Villa Borghese. Reviewed by Jhoan on Jun 22 . Description: Great balance and simplicity in driving despite its large size. As soon as you close the door you will feel the pride of driving an exceptional luxury car, where design and engineering come together in performance. I rented the car of my dreams for the weekend to Italy. Inside it is full-featured, with air conditioning, canopy roof, integrated browser and tinted windows. Very large luggage compartment.